FORT WAYNE, Ind. (CTSFW)—“And Jesus went throughout all the cities and villages, teaching in their synagogues and proclaiming the gospel of the kingdom and healing every disease and every affliction. When he saw the crowds, he had compassion for them, because they were harassed and helpless, like sheep without a shepherd. Then he said to his disciples, ‘The harvest is plentiful, but the laborers are few; therefore pray earnestly to the Lord of the harvest to send out laborers into his harvest’” (Matt. 9:35-38). Thanks be to God for His great goodness and mercy; on April 24 and April 25, students at Concordia Theological Seminary (CTSFW), Fort Wayne, learned where they would serve in their near futures, as vicars, deaconess interns and pastors. The Assignment and Call Services culminated in the announcement of each student’s placement, in cities and churches across the United States. To see where the Lord of the harvest is sending His laborers, go to callday.ctsfw.edu/map. For students headed out on vicarage or diakonal internship, this assignment marks another year of learning, bringing them ever closer to their future vocation. For those about to become pastors, these congregations are where they will be installed and ordained into the Office of the Holy Ministry. To watch either service, print off the lists of assignments and placements, or see who’s coming to your district, go to callday.ctsfw.edu. Remember, as well, the many congregations that still cry out for a shepherd, whose calls go unfilled this year. 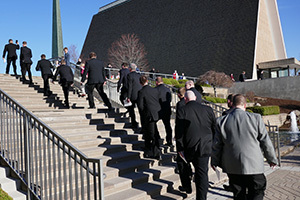 Though together CTSFW and her sister seminary, Concordia Seminary, St. Louis, are placing 98 men (79 through the Master of Divinity Program and the rest through other routes), the laborers are ever few; that number is still 29 short of the 127 applications for candidates sent in by congregations this year. Pray earnestly for the men and women considering a future in church work, and encourage those who may not have yet recognized their own gifts for ministry and service. For more information about the path towards becoming a pastor or deaconess, go to www.ctsfw.edu/Admission or call 800.481.2155.